Protest slams armed neo-Nazis in Houston | Fight Back! Houston, TX - The neo-Nazi White Knights of America staged a "White Lives Matter" rally outside the Anti-Defamation League office in Houston on Oct. 1. This small hate group also protested outside of the NAACP headquarters with shotguns a few weeks ago. Over 50 people counter-protested the white-supremacist hate group and demanded that they leave. Police stood protecting the white supremacists and their spokesperson, who wore a “Trump for president 2016” hat. “We've come here today to let these fascists know that they aren't welcome anywhere. We will be wherever they show up, and reject their fascist message of racism, hatred and fear-mongering," said David Smith, a member of the Houston Socialist Movement who organized the protest. The much larger anti-racist crowd chanted, "Hey, hey, ho, ho, Nazi scum has got to go!" and "Black lives matter!" "People from different communities have come out today to show them that we aren't scared, even when they carry guns to intimidate us. Black lives matter!" a member of Students for a Democratic Society (SDS) said in a speech. Earlier this week a man dressed as a Nazi and connected to the “White Lives Matter” group shot and injured nine people in Houston. 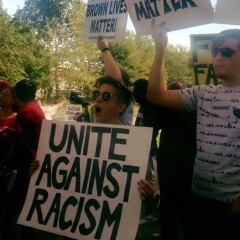 The anti-racist protesters stood for four hours unified and strong in their message, facing off with the armed fascists.